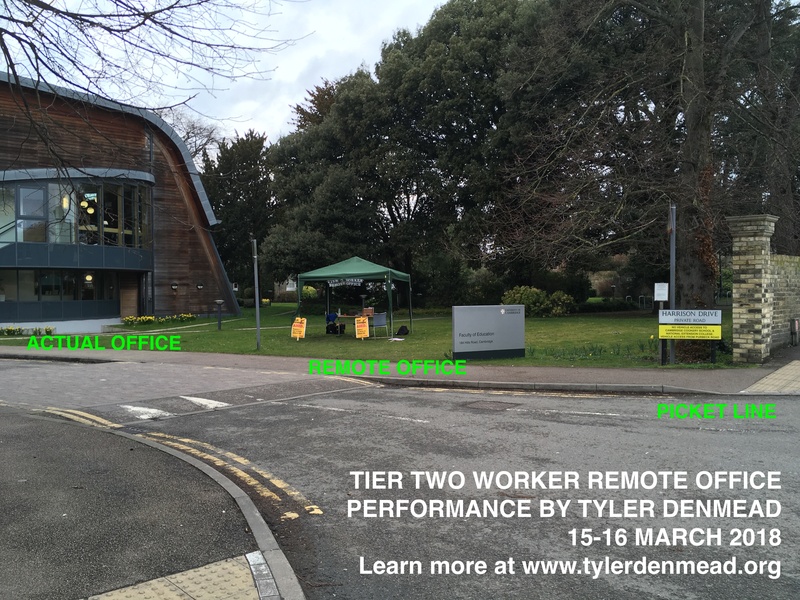 On March 15th and 16th, 2018, I staged a performance art piece titled “Tier Two Worker Remote Office.” Through this performance, I addressed the precarious position of Tier 2 workers who are currently engaged in UCU’s industrial action. If Tier 2 workers participated in the largest industrial action in the history of the UK higher education sector for more than 20 days, then they risked deportation by the UK Home Office. I live tweeted the performance at #T2WRemoteOffice. I also wrote an article on the performance, which will be published in the Journal of Curriculum and Pedagogy. Below is how I introduced the performance online. In this performance, I will stop striking and I will to return to work. However, I will be working from my Remote Office. The Remote Office will likely be located near, but not on, the picket line at the Faculty of Education. In addition, The Remote Office will be near, but not in, my Actual Office at the Faculty of Education. The Faculty of Education is located at 184 Hills Road, Cambridge. During this performance, I will do what I normally do when I work. Currently, I have over 200 work emails that require responses. I have some administrative tasks that need completion. And I plan to do some reading on cultural politics and resistance. I currently have no meetings scheduled, but I may schedule meetings if people are able to meet with me in my Remote Office. You are welcome to view my performance. Feel free to chat with me while I am working; colleagues often do that when they pop into my Actual Office. But please be considerate. I have work to do. And don’t be afraid to touch me while I am performing. Sometimes, I shake hands or hug my colleagues when I work. If it seems appropriate in the moment, I am happy to do things of that nature. The performance is free and it requires no tickets in advance. If you feel particularly moved by the performance, and feel that it is necessary to pay something for the experience, then I recommend making a donation to the UCU Strike Fund. Also, please consider signing this petition to stop the deportation of Dr. Ernesto Schwartz-Marin and Dr. Arely Cruz-Santiago, who are both academics on Tier 2 Visas at Durham University who risk deportation for simply doing their jobs. “Tier Two Worker Remote Office” is inspired by the artwork of Jorge Lucero, a Mexican American conceptual artist. Lucero’s artwork explores the intersections of art, pedagogy, and public engagement—and is influenced by artistic movements including dada, fluxus, and minimalism. Lucero’s artwork is relevant to university life today because his artwork plays with the marketisation of academic life as material. As academics are expected to do more with less, be legible within the construct of regulatory frameworks, to churn or burn, and so forth, Lucero’s artwork tests the limits of what counts as artwork and scholarship, which for Lucero, is almost always the same thing. If minimalists ask, “How little can something be and still be art?”, then Lucero’s artwork often asks, “How little can something be and still be art and scholarship?” Lucero’s artwork also often asks how much his artistic practices might allow him to do the scholarship and teaching that he might never otherwise get to do because he always has a committee meeting to attend. For example, in one performance, Lucero laid in a bed in an art museum for hours and read out loud academic books that he wanted to read, but never could because he was too busy being an academic. At a Zizek conference, he gave a series of lectures at sunrise in a large van to no one. He has “transformed” his office into a participatory installation art piece, which is titled, “The Jorge Lucero Study Collection.” But it is hard to tell the difference between his office and his art installation except for the fact that his office is now on exhibition tour, which is normal for art, but not offices. Drawing on Lucero’s work, my performance, “Tier Two Worker Remote Office” asks how little difference there is between striking and working as an academic, particularly one interested in the arts and education. I am wrestling with this distinction through this artwork because I genuinely cannot get my head around how striking is not scholarly work, even though, through striking, I am withdrawing my labor and not getting paid. On the picket line, I have engaged in scholarly conversations, built collegial relationships, and weighed in on the future of the institution in ways that I never would have otherwise. We are teaching students and learning from students, and students are teaching each other and demanding a higher kind of relationship to their institutions of higher education. The picket line will fundamentally transform my academic career and the institution where I work. This is what we call impact. With that in mind, it seems to me that going back to work will actually, in a contradictory way, be a return to not working. So, “Tier Two Worker Remote Office” is my attempt to play with the spatial and phenomenological dimensions of labor and withdrawing labor as a scholar (and asserting my autonomy to exercise that right as a scholar and make university life what I want it to be)–particularly in light of my precarious position as a Tier 2 Worker At Risk of Being Deported. I want to show what the work of academics looks like, which might look like striking and might look like my Remote Office at work. These difficult to delineate performances of working and not striking and striking and not working will be brought into literal proximity through this performance, in the space between the picket line and my Actual Office. Even though I cannot go to the picket line (for risk of being deported), I also know that I cannot cross the picket line and go into my office. For me, the line is so symbolic that crossing it would bepainful. I could not be productive as a worker. In pain, I would stare out my office window at the picket line and not get anything done. I would hear the cars honking for the picket line and it would hurt. So, I think it would be horribly unproductive for me to be in my Actual Office as a scholar. I guess I could stay home—but then that feels like cowardice. And scholars are supposed to take risks and be courageous in their scholarship (and in their striking). Given these dynamics and my position, I’ve decided going to occupy the liminal space between the picket line and my Actual Office and see what happens at the “Tier Two Worker Remote Office.” I will live tweet during my performance about how my (art) work is getting on. You can follow me @td287.